The 300 Raptor just might be the most powerful .30-Cal magnum for a conventional-sized receiver. Share the post "The 300 Raptor — Monster .30-Caliber Magnum for Long Range"
Are you a confirmed wildcatter? Do you like to experiment with custom cartridge types? Or do you just like the extra performance you can get from a specialty cartridge such as a 20 Vartarg or 22-250 AI? Well, if you love wildcat cartridges, you’ll probably enjoy this book. Now available for the first time since 2003, The Handloader’s Manual of Cartridge Conversions explains the processes and tools needed to convert standardized brass into hundreds of different rifle and pistol cartridge types. A vast variety of case designs are covered — from vintage cartridge types to modern, cutting-edge wildcats. Share the post "Wildcatter’s Road Map — Cartridge Conversion Book"
Fred Zeglin has released a Kindle eBook edition of his popular book Wildcat Cartridges — Reloader’s Handbook of Wildcat Cartridge Design. Gunsmith/author Zeglin explains: “The print edition of Wildcat Cartridges has gone out of print. We have plans to produce a second edition, but that is currently on the back burner. Demand of this book has remained strong so the decision to offer the first edition in a e-book format was made.” The Kindle eBook edition retails for $9.99 on Amazon.com. You can preview a FREE SAMPLE of the book to “try before you buy”. Share the post "Wildcattin’ Wisdom — Good Resource for Wildcat Cartridges"
Retired gunsmith Stan Ware is a talented shooter who’s not afraid to think “outside the box”. Stan competes in both Hunter Benchrest (HBR) and Varmint for Score (VFS) disciplines. In his quest to build the ultimate Hunter Benchrest cartridge, Stan created the radical “Wolfpup” wildcat, based on a 6mmBR parent case. Noting the dominance of 30 BRs in VFS matches, Stan wondered if a stretched 30 BR could work in HBR competition. The challenge was case capacity. Under HBR rules the cartridge must hold at least 45.0 grains of water, equal to the capacity of the classic 30/30 case. Stan’s radical short-necked Wolfpup shot great from the get-go. Once he found the right velocity node, the gun shot in the ones and zeros with both 7-ogive and 10-ogive bullets, both 118s and 125s. The Wolfpup proved easy to tune — it’s not finicky at all. And it’s a winner. Stan began shooting the Wolfpup in 2006 in both VFS and HBR matches and the ‘Pup’ started winning matches right away. In 2007, Stan won the Wisconsin State VFS Championship shooting the Wolfpup. In June 2010 at a Webster City, Iowa VFS match, Stan won the Grand Agg and posted high X-Count for the match, while placing first at 100 yards and second at 200 yards. How’s that for a cartridge that almost ended up in the trash bin? Stan’s Wolfpup chamber has a neck dimension of 0.330″. He turns his necks for a 0.327″ loaded round. Bullets are jammed .020″ forward of first contact with the lands. When he closes the bolt it pushes the bullet back in the case — almost a soft seat. Stan notes: “To start with I normally bump the shoulder .0005-.001″ so they go in easy. Just by doing that I get a little neck tension. I also use a bushing. Right now I’m running a .322, but it’s not particularly sensitive. I’ve tried one-thousandths increments up to a .325 bushing and couldn’t tell a lot of difference.” For bullet seating, Stan uses a Wilson 30 BR seater die into which he ran the chamber reamer. This gives perfect case fit during seating operations. Photos courtesy Ryan Ware and Stan Ware. Share the post "Wildcat with Almost No Neck — Stan Ware’s Wicked Wolfpup"
Barry O. (aka “TheBlueEyedBear”) is a long-time AccuateShooter Forum member and friend of the site. Each year he manages to acquire another good-looking, great shooting rifle. In 2009 he took delivery of an amazing 4000 fps 300 WSM varminter, and for 2010 he put together a fantastic 6mm Super LR long-range varminter on a BAT SV action. Barry actually sourced many of the components for his new rifle through our AccurateShooter Forum Free Classifieds. CLICK HERE to read all about Barry’s new BAT-Actioned varmint rifle, the latest in our popular Gun of the Week Series. The Richard Franklin walnut LowRider stock (above) for Barry’s new rifle came from fellow Forum member “Preacher”, who also did most of the metal work. The gun is chambered as a 6mm Super LR. This is a 30°, long-necked wildcat based on the .243 Winchester parent case. The 6mm Super LR was developed by Robert Whitley, who wanted something similar to the 6XC, but with “more boiler room” to push the 115s comfortably at 2950-3050 fps. The 6mm Super LR wildcat is easy to make. Robert Whitley figured out how to reform domestic .243 Win brass with one simple pass through a Redding 6mm Super LR full-length sizing die. Robert has commissioned these dies from Redding. He’s got them in stock right now. Call Robert at (215) 348-8789 to order. You can learn more about the 6mm Super LR on Whitley’s www.6mmAR.com website. Share the post "New Featured Rifle Story — The Bear’s 6mm Super LR"
Robert Whitley has a new .224 version of the 6.5 Grendel cartridge. 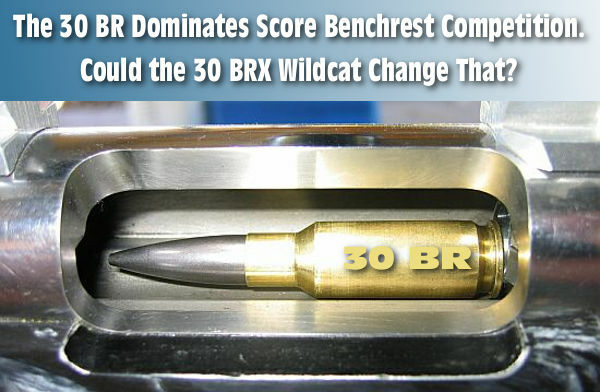 The goal was to create a low-recoil but high-BC round to use in AR-platform match rifles. Based on the performance Whitley is getting, we think this wildcat would also be an excellent bolt-gun round. Whitley tells us: “I have recently been working on another 6.5 Grendel progeny I have made up and call the ‘.224 AR Mag’, which is the 6.5 Grendel case necked down to accept .224″ bullets. I am very impressed by this cartridge and Berger Bullets’ .224″ heavy, high-BC bullet offerings are just beautiful (dimensionally and otherwise) for use with the cartridge. I also have reloading dies for the .224 AR Mag and I am going to make up a page on my website for the sale of AR-15 uppers chambered in the .224 AR Mag. Above you can see the new 224 AR Mag cartridge (right) next to a .223 Rem (left) and a Berger 82 gr BT bullet (right) next to a Sierra 77 gr BTHP bullet (left bullet). The Berger bullet has a good bit higher BC than the Sierra 77 BTHP (.432 BC for the Berger vs. .362 BC for the Sierra). In the 224 AR Mag, the Berger 82 gr BT bullet sits at 2.260″ OAL (.010″ off the lands and a perfect magazine length) with the junction of the boat tail and bearing surface just ahead of the neck and shoulder of the case. You cannot properly load the 82s to mag length in a .223 Rem because the case is so long the bearing surface of the bullet starts to disappear into the mouth of the case, and at magazine length the Sierra 77s sit so far back in the .223 Rem case they hog valuable powder capacity. The .224 AR Mag has a powder capacity of 36 grains of H2O vs. about 29.5 grains of water weight capacity for the .223 Rem. That’s a major difference in powder capacity. In addition you have bullets like the .224 Berger 90gr VLD and 90gr BT bullets that have BCs of .552 and .525 that can be driven very effectively and fast by the .224 AR Mag because of its case capacity. Bear in mind the brass is all Lapua small primer brass as well — what’s not to like? I have done chrono testing of the cartridge with Varget and RL-15, using the Berger 82 gr BT and the Berger 90 gr BT bullets. This cartridge really can spit them out fast! (See load data below).” NOTE: Whitley could drive both bullets about 100 fps faster using 28.0 grains of Varget or RL15, but those loads approached max practical pressure. Start low and work up. CLICK HERE for Load Specs and Chron Testing Results (.pdf file). Share the post "New .224 Cartridge for AR Match Rifles"